The Subir Choudhury Practice Grant for emerging artists and curators is a biennial grant set up to encourages innovative artistic and curatorial practices in Bangladesh. It is alternatively attributed to artists and curators, and focuses on developing practices for which its reception will make a meaningful contribution. 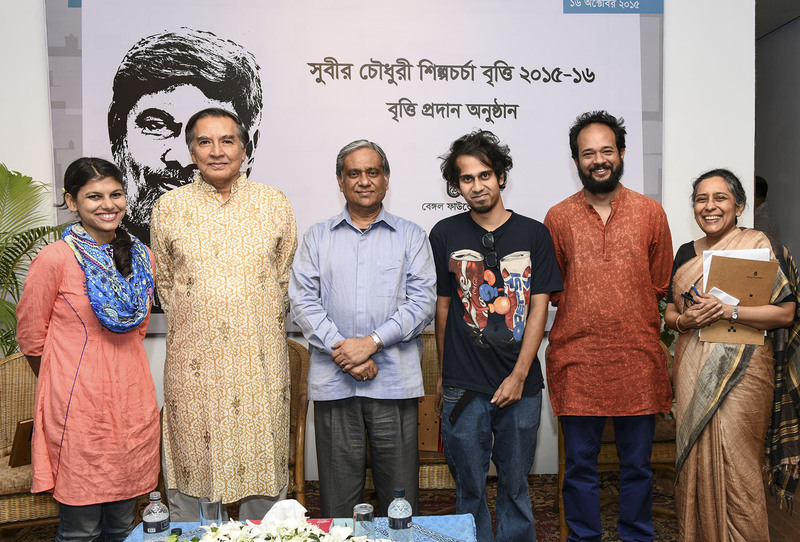 The grant perpetuates the vision of the late art activist and trustee of Bengal Foundation Subir Choudhury (1953-2014), who dedicated his life to the development of the arts in Bangladesh. Abir Shome aka R.Mutt is a Bangladeshi artist, emerged from his very conscious decision ‘Act of Existing with Art’. Born in 1987, Dhaka, he completed his Bachelor in Fine Arts from Dhaka University Faculty of Fine Arts in drawing and painting. Soon after his graduation he was enrolled to Goldsmiths, University of London in BA Fine Arts but after few months he left the course. In 2015 he self-published a book titled ‘In Dhaka’ or ‘The last days of Sodom’. He was a memberof the collective OGCJMart from 2011 to 2015. He is a joint recipient of Subir Choudhury Practice Grant 2015, Bengal Foundation. Abir is a multidisciplinary artist. Drawing, Text, Video, Internet based arts are the major focuses of his practice. Born in 1989, Eshita Mitra completed her Masters in Fine Arts in Printmaking from Dhaka University. Eshita is primarily interested to work with her surroundings using the varied disciplines of printmaking, video, photography and sculpture. She believes art prevails everywhere and an artists’ role is to search for it. She often collects objects she finds and alters their essence. To Eshita, every object possesses its own value and creates thought, sense and dimension. When an object is freed from pre-existing notions, eventually it allows new interpretations to rise. In 2012, Eshita exhibited in OGCJM, a group exhibition curated by Rafiqul Shuvo and in 2009 she won an award at ‘VoVa’ MiniArt Biennale, Hungary.